We are now 5 months in to our life as a family of four. 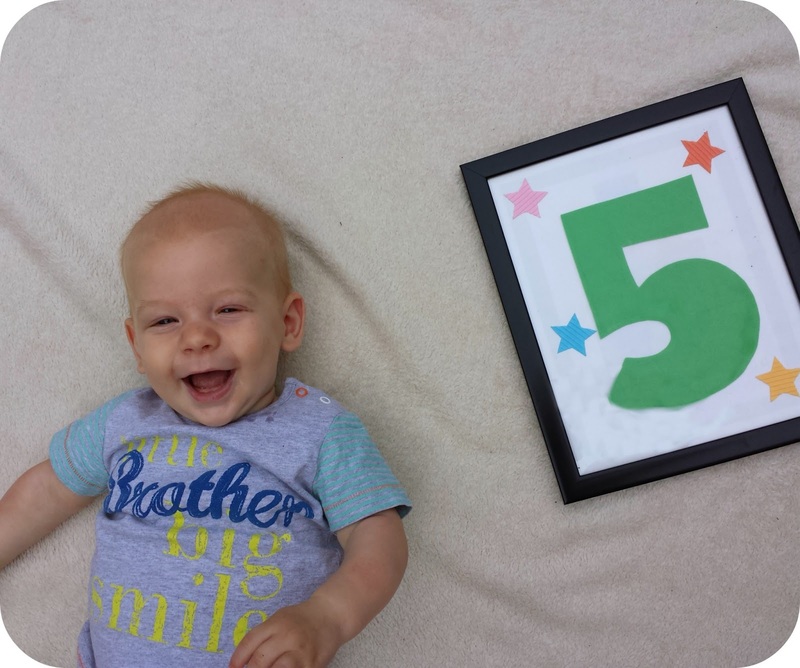 This last month has had its ups and downs and Archie has celebrated turning 5 months old in the hospital. 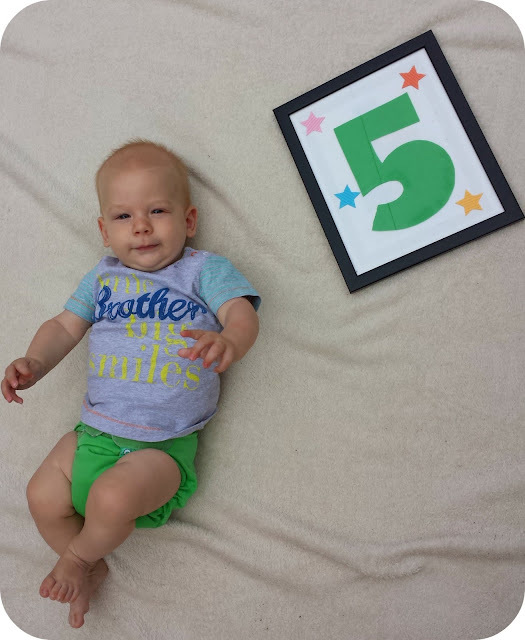 5 months seems to signal a huge change and my baby boy seems to be growing up rather too fast. Archie is well and truly a mummy's boy. He can look rather serious at times, but the moment he catches my eye a huge smile spreads over his face. He is happiest in my arms and doesn't like to venture too far from me. 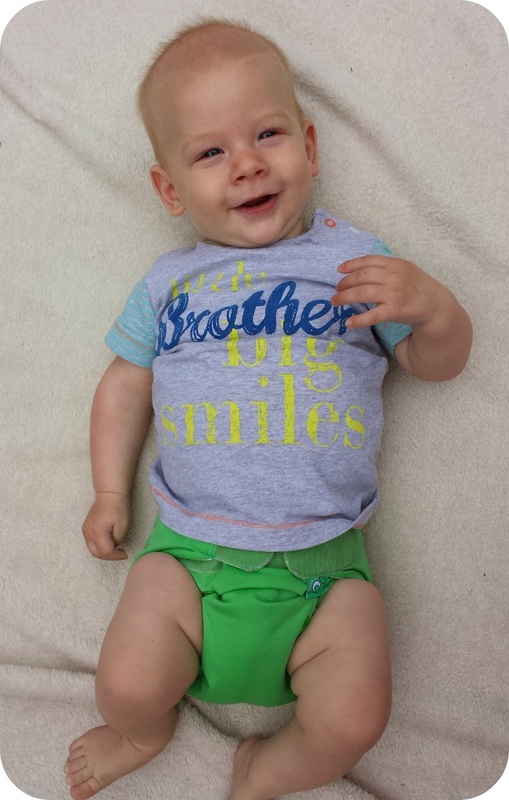 He has become very smiley over the last month though and he now gives out gummy grins to anyone who will talk to him. He is laughing more and more and loves my silly voices. I think he will be the thrill seeker of the family as he loves being thrown in the air, or when I make sudden movements or loud noises. He may not be crawling yet, but Archie is well and truly on the move. He explores every corner of his cot as he twists, turns and rolls around and in the blink of an eye he has moved across the room somehow. He likes to curl his legs underneath him and then push off against them to go forward. He is still happiest when he is stood up and hasn't quite mastered sitting unaided yet. It appears that I breed big hungry babies, and just like his big brother, Archie has stopped putting on weight when he turned 4 months old and started dropping through the centiles in his little red book. Despite me wanting to wait until 6 months to wean, we have been advised to start now and from 5 months our weaning journey will begin. Dylan has always been affectionate with his kisses and hand holding, but he is now asking for cuddles with 'Bubba' all the time too. Dylan loves to show Archie everything he is doing and all day long I hear 'Look Bubba, look' as Archie is shown everything from a toy, to grapes, to Dylan's knees. Teething is well and truly underway and Archie is soaking through bibs in no time (chewing them probably doesn't help). Everything goes straight in his mouth and I have invested in a Sophie Le Giraffe after reading such fab reviews. Archie fell instantly in love with it, and his little legs stiffen in excitement when he hears the squeak. I see no signs of any imminent arrivals but Dylan didn't get his first two until 8 months so I expect Archie will be similar. Breastfeeding is still going well and we are still demand feeding with no real schedule. Nights are all over the place but we are sharing a room on the ward with a child who wakes up screaming at random points in the night as well as having children that need inhalers or medicine through the night, and don't always take them quietly. I have no idea how much Archie is waking up from other noises or from wanting milk but even on our night at home we have two night feeds still. At 5 months Archie is a happy, healthy and beautiful little baby but I can see him growing up before my eyes. He's just gorgeous - such a lovely smile, and growing so fast! I'm finding everything's going even more quickly this second time around, I can't quite believe how big all these babies are getting all of a sudden!